Kelly Ripa Blissfulness in the spa colorway. 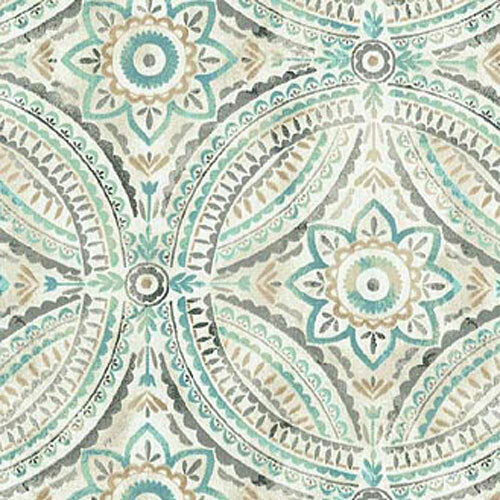 Contemporary floral design in shades of teal, gray, tan on a white background. Suitable for drapery, decorative pillow covers, headboards, crafting or other home decorating projects. Q: I need approximately 25yds of item #KR1384. Is it possible to get the entire order as one piece? If so, How much would the cost be shipped to NJ zip code 07432? A: We currently have one continuous piece measuring 24 yards. We offer free shipping on orders $100 or more. Q: How well would this hold up on a couch? A: This fabric has a DR count of 9000. That weight is not recommended for upholstery use. We recommend a minimum DR count of 15, 000 for upholstery.